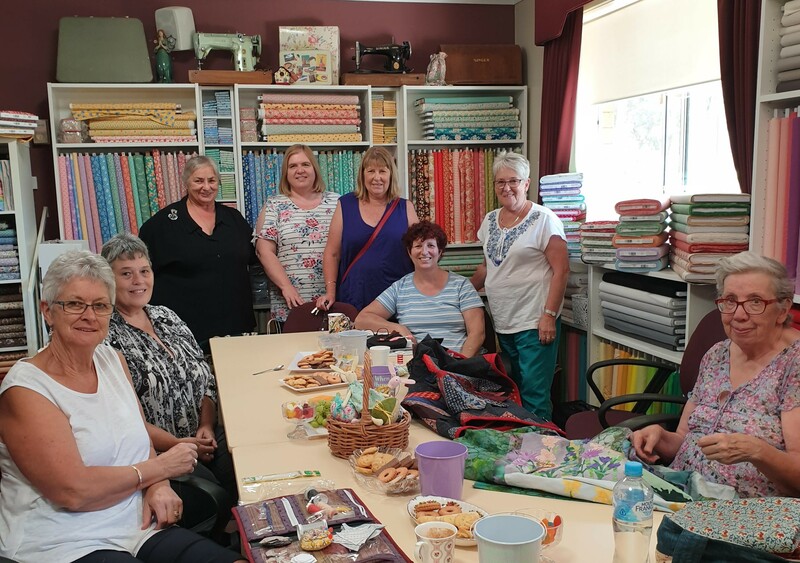 A group of eight Goldfields Quilters spent a lovely day sewing at Maree St Clair Quilts in Strathfieldsaye on Saturday 23rd March. 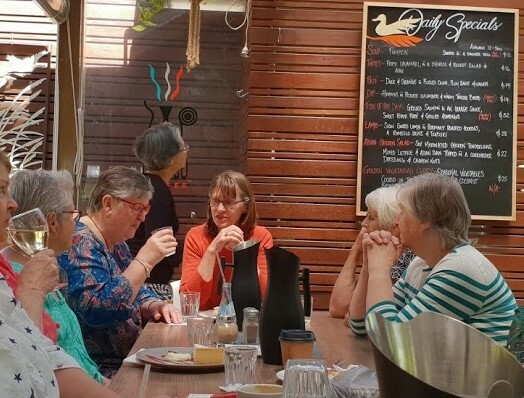 Maree provided a delicious morning tea, great company, and LOTS to look at. 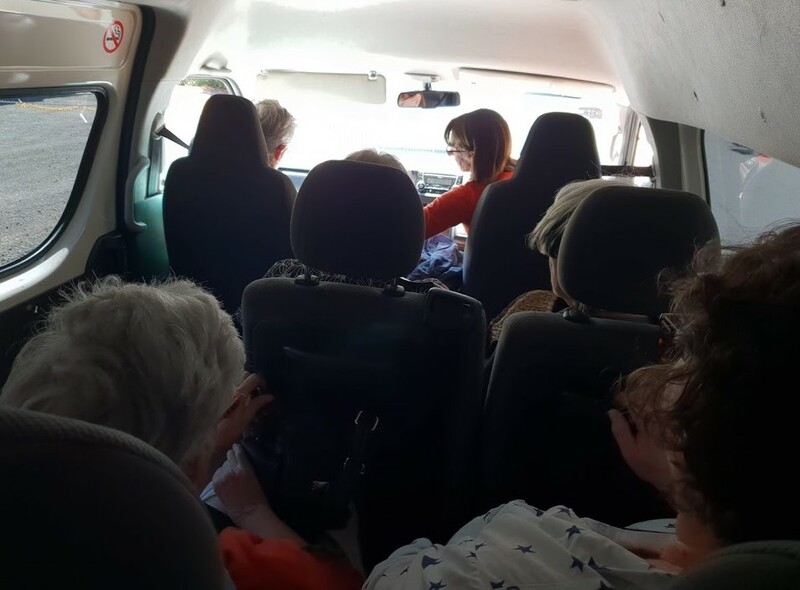 We enjoyed a chat with a bus full of ladies from Alexandra who were on a shop crawl, and admired Maree’s sweet little grandson. Thanks Maree and Annabelle for a wonderful day! 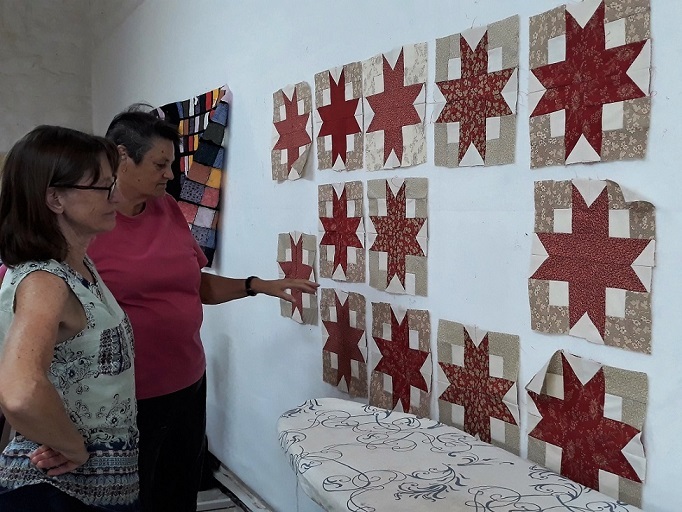 This week at Goldfields Quilters “Sit and Sew”, Merlyn did a demonstration using Diannabelles patchwork template stamps. Everyone brought along some scraps to make their own Le Moyne star block. 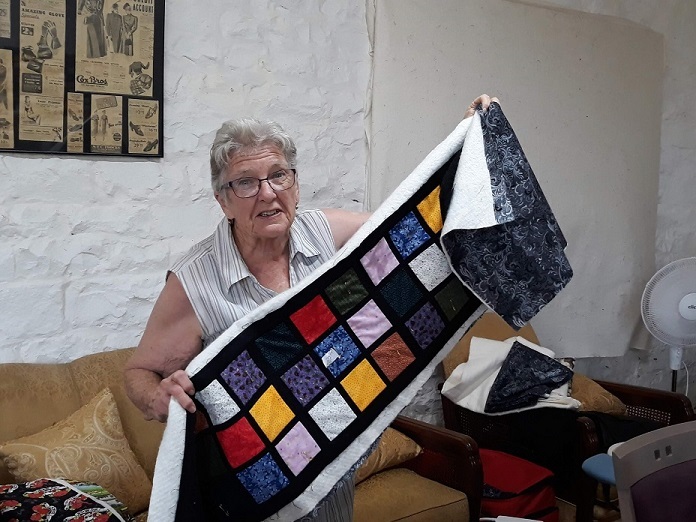 Merlyn also brought along her recently completed quilt for a bit of show and tell. Don’t you just love her quilt label?! 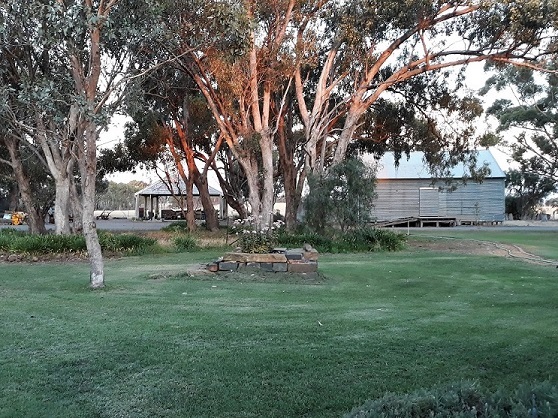 Last weekend was Goldfields Quilters retreat at Boundary Farm. 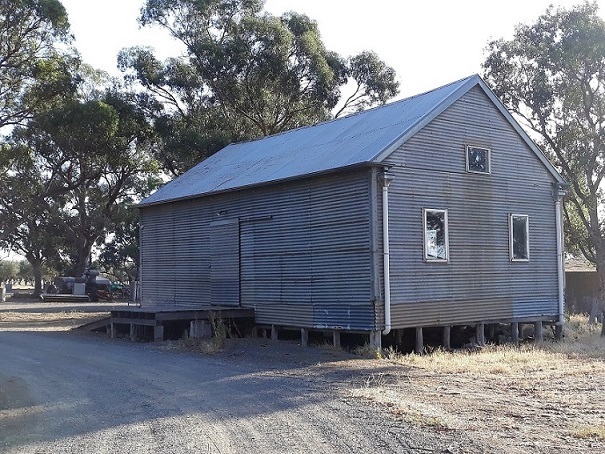 Patty Ritchie has told us all about it and provided some lovely photos of the property and what the girls got up to…. 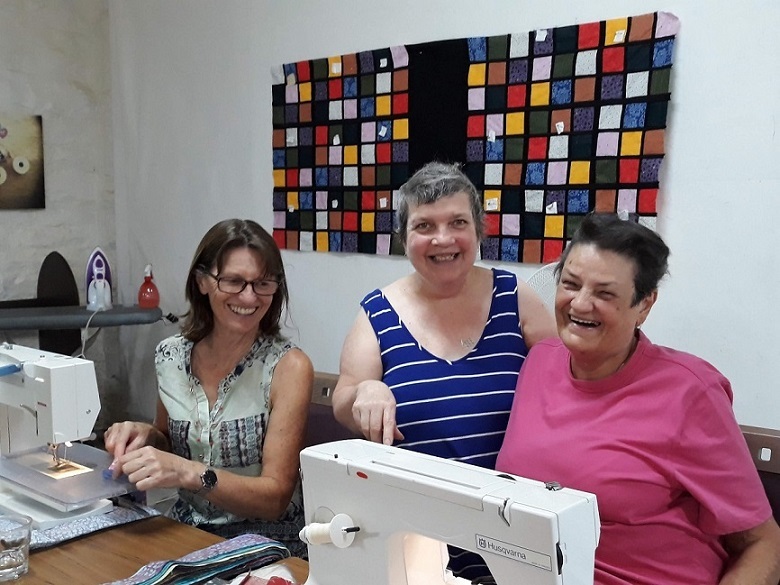 A wonderful weekend was had by 6 of our ladies, Lorraine, Cherie, Irene, Patty, Sue and Christine, along with 3 girls from Strathdale Quilters. Thanks Marilyn, Pat and Kaye for joining in and sharing our weekend. Lovely friendships were made with plans for a get together in the future. 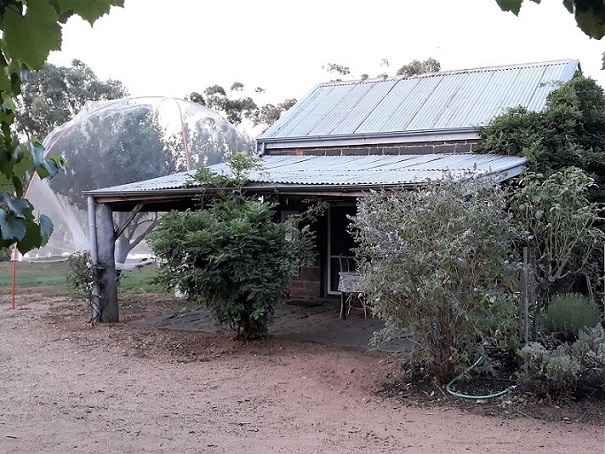 Arriving around midday on the Friday we wasted no time in unloading our gear and setting up for a lovely 3 days. Machines all ready, sleeping arrangements sorted it was time for our lunch. 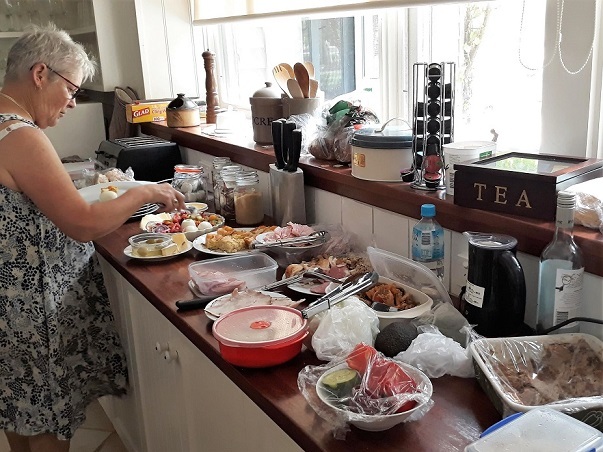 Everyone shared in the supply of food… and there was lots of it and so very yummy! Thanks everyone. This set the pattern for the rest of our time there. Weather was very warm and we were cooled by the many fans supplied by our hosts, Paul and Paula. They popped in each day to make sure that all our needs were being catered for. 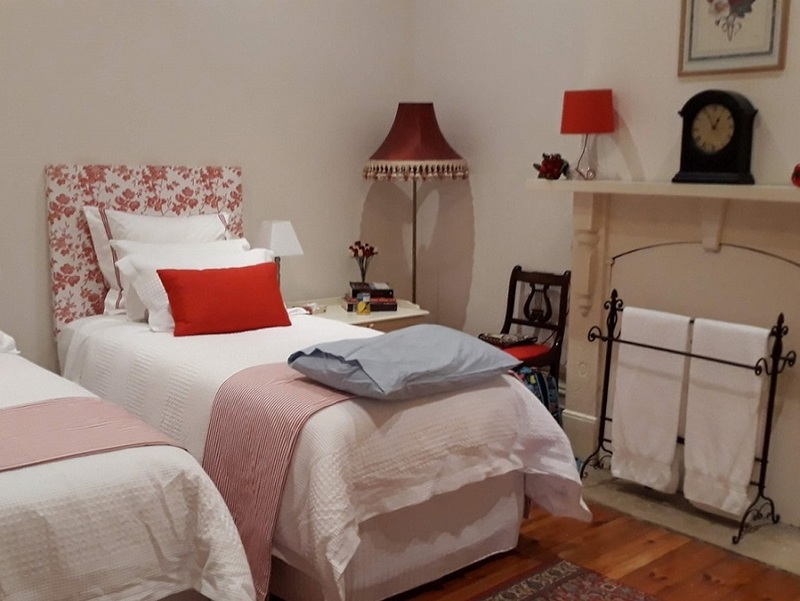 What a wonderful venue, lovingly restored and renovated with beautiful, very elegant and comfortable furniture throughout. 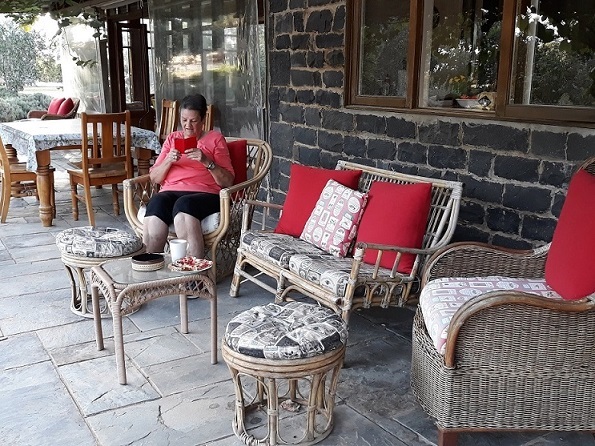 Breakfast and coffees were enjoyed by many sitting outside on the verandah looking out over beautiful gardens, green lawns and a view to our sewing studio which was once a dairy/cheesery. 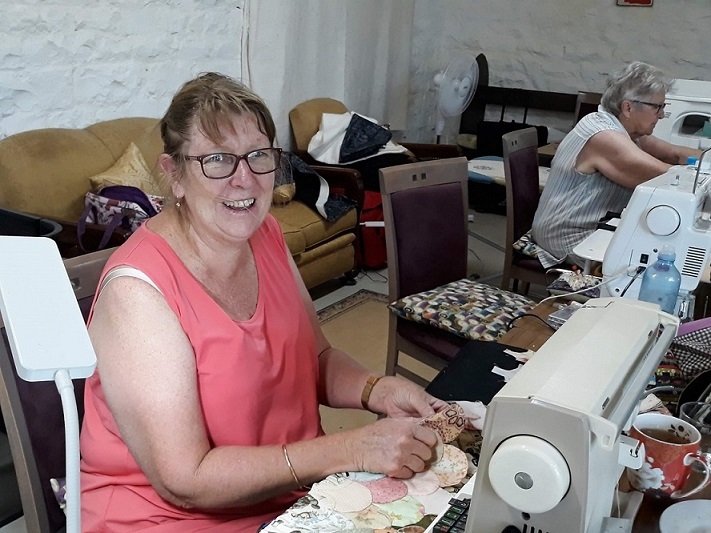 Lots of interesting and varied sewing was happening and Sunday afternoon showed great results. 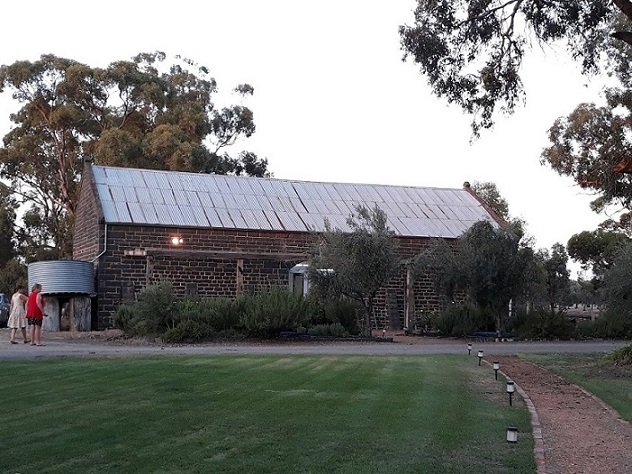 Boundary Farm is located in Baringhup West and only a 15 minute drive from Maldon. 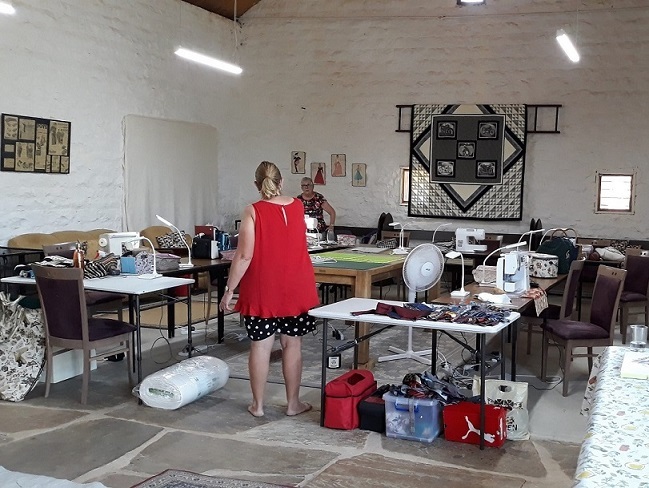 It’s a fabulous venue for craft groups. 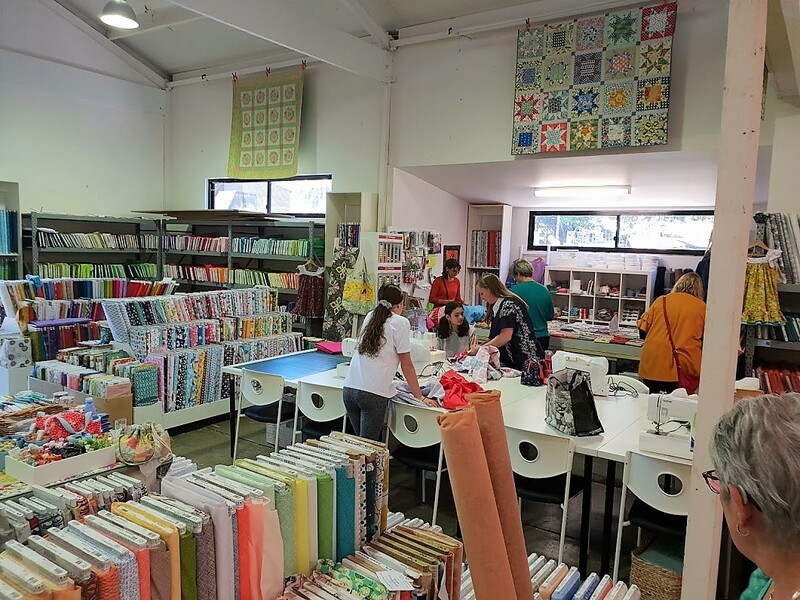 We have a date for this year’s Quilt In….. Saturday 19th October. Come along and join the fun, it’s going to be a fabulous day! 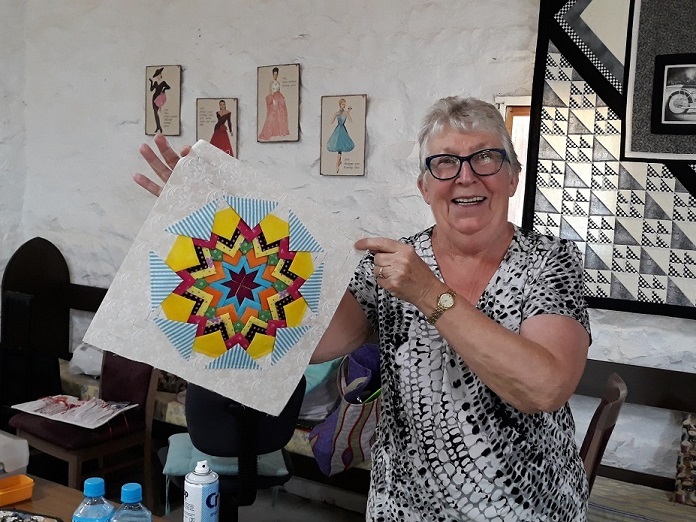 Louise Lott and Lisa Kerr from the Max & Louise Pattern Co will be guest speakers, They will be bringing quilts to show us and their patterns and fabric range for sale. 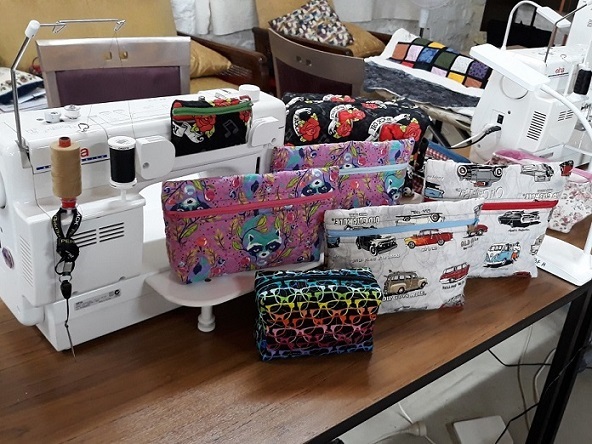 There’ll be pop-up shops from Maree St Clair Quilts and The Village Patch, template stamps from “Diannabelles”, and also a group trading table. Something for everyone. We would prefer bookings and payments in advance so contact us to book your place so we can allocate seats for groups to sit together. There’ll be a little bonus gift for everyone who has booked and paid by one week before. There’ll be a huge raffle with lots of prizes to choose from and every attendee will receive a door gift. 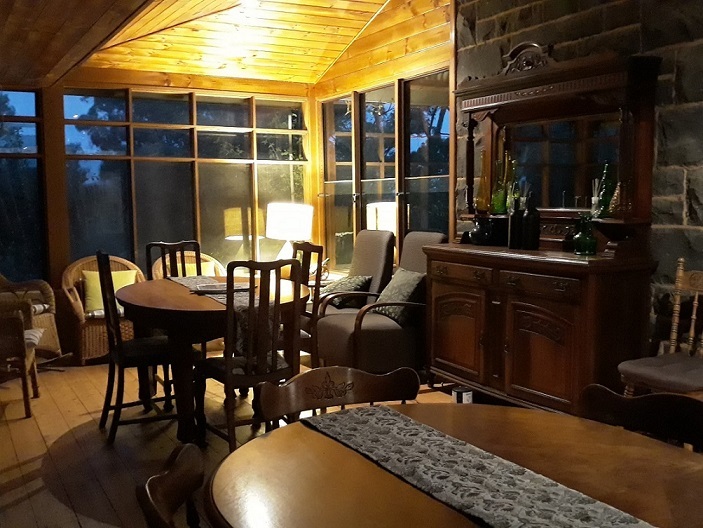 Everything will be provided : tea, coffee, morning and afternoon tea, and even a light lunch. Email bookings : goldfieldsquilters@gmail.com or telephone number on flyer below. You can click on the flyer to print it. 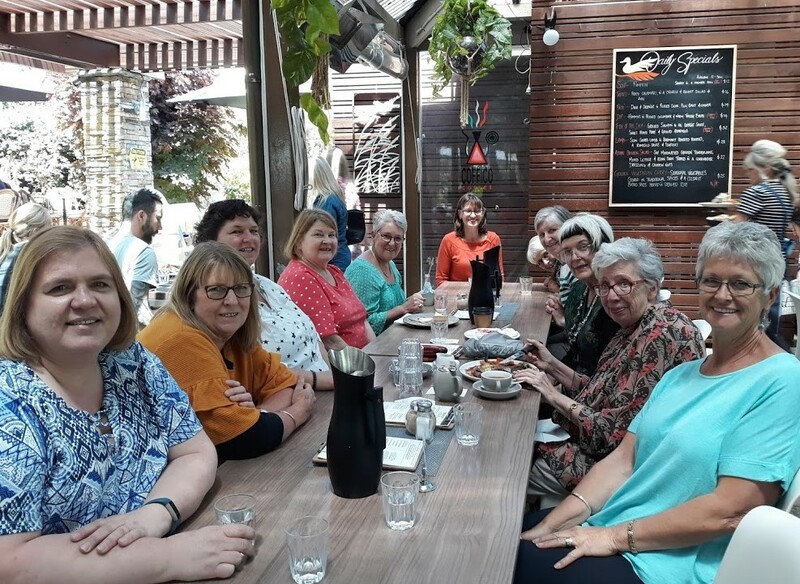 We had a lovely get-together for Christmas on 1 December 2018. 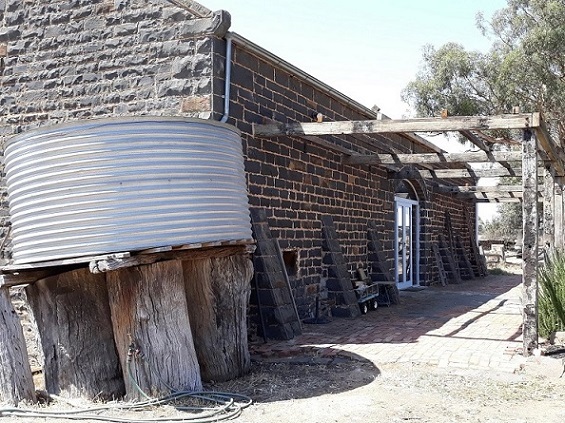 Lunch was at the Goldfields Track Cafe. It was an enjoyable afternoon with Kris Kringle gifts to share around. 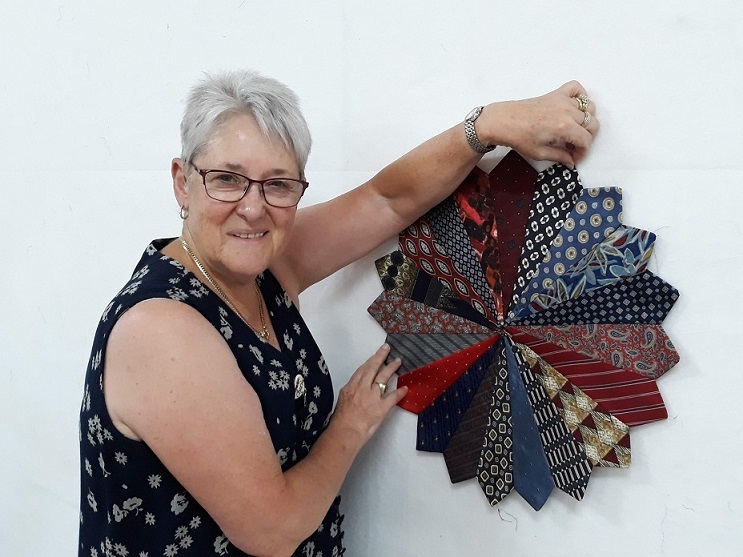 Wednesday 28th November saw Patty generously giving her entire day and evening to teach the Goldfields Quilters how to make a lovely stripey tote bag. 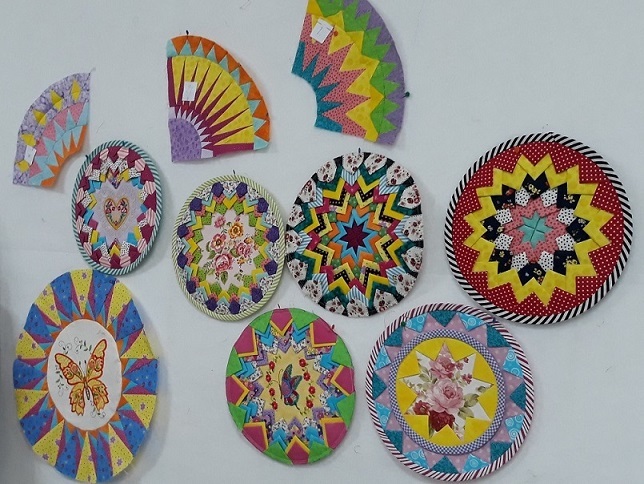 The day group worked diligently from 10.30 until about 3.30 with a few going on even longer. Back on deck at 6pm Patty then got the evening group going. They had a little less time available so nobody actually completed their bag but did come close. It was a very enjoyable day… although Patty no doubt was exhausted. Thanks so much Patty for sharing your knowledge with us. 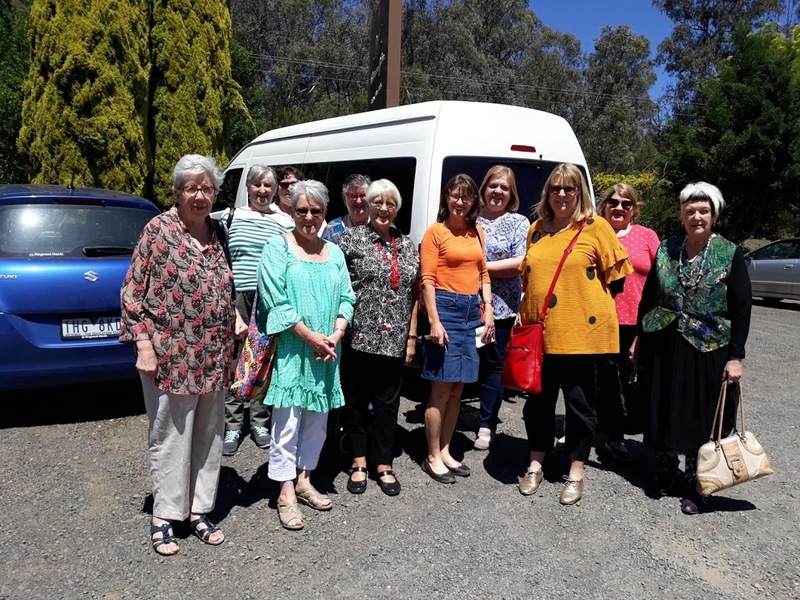 On Saturday 18th November, 12 Goldfields Quilters enjoyed a day out to Warrandyte. 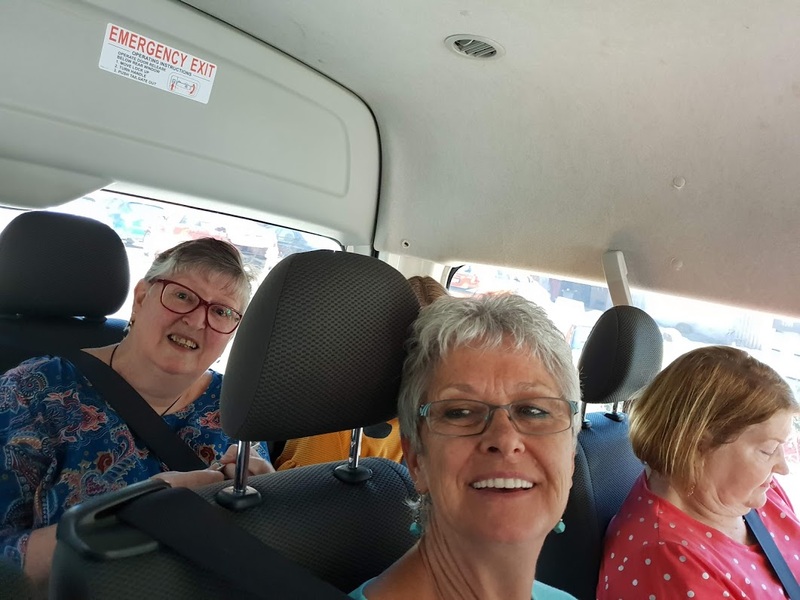 Thank you to the drivers of our hired mini bus – Christine Christie, who did a wonderful job in very challenging windy conditions on the way down, and on the way back, Cherie Woodfine and Sue Grimes. 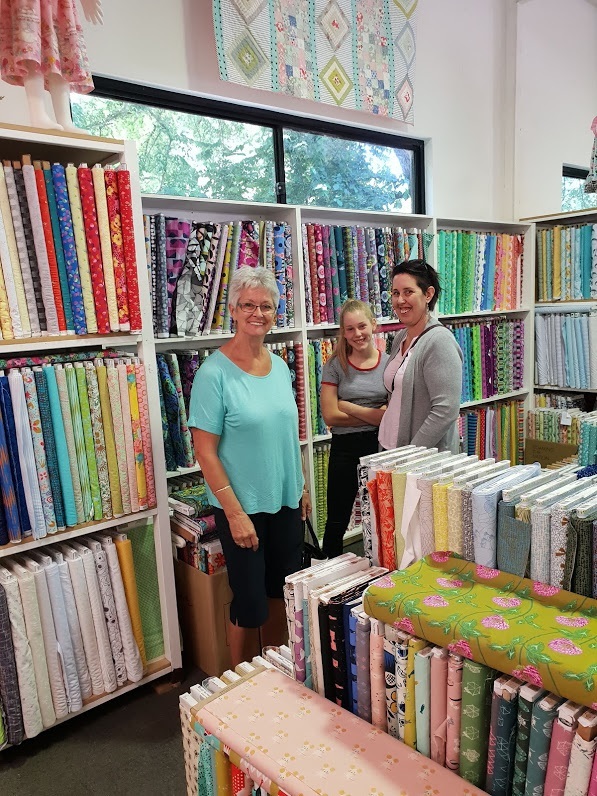 We made a stop on the way at The Quilt Shop in Eltham which was a lovely shop stocking bright and modern fabrics. It’s beautifully laid out with a lightly rustic charm. Shame I don’t have a photo. There was plenty of browsing…… and white paper bags in hands as we got back on the bus. 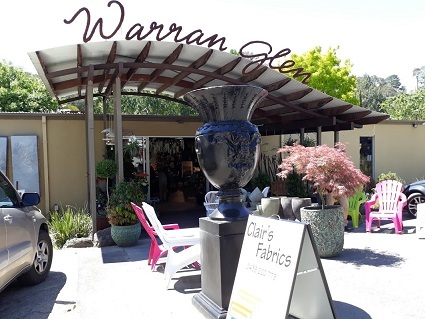 Next stop was the main purpose of our journey – Clair’s Fabrics at Warran Glen nursery, cafe and gift shop. 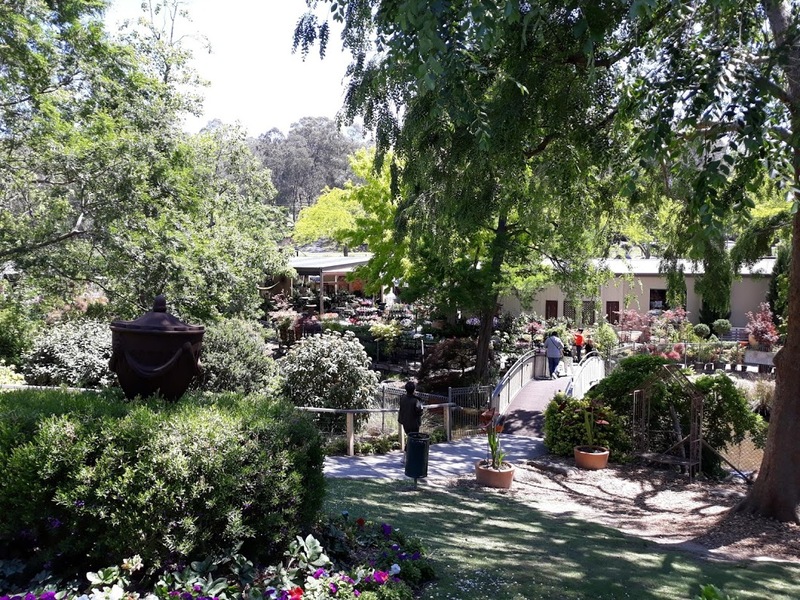 The grounds are lovely with a bridge over a small lake to reach the cafe and lots of shady trees. Clair’s Fabrics was choc full of fabric. 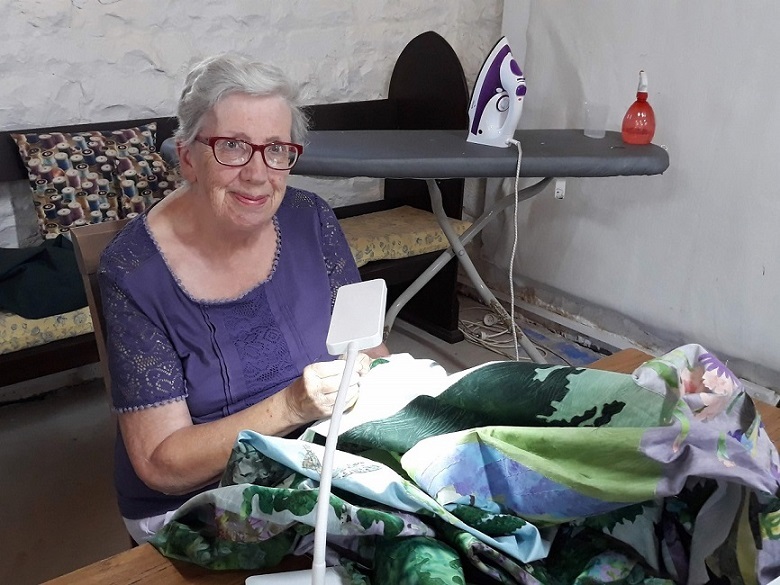 There was a big central table for “sit and sews” and some young girls learning to sew clothing from patterns. We had an enjoyable lunch at the cafe and there were more purchases carried back onto the bus. Our final visit was Bustle and Bows in the main street of Warrandyte before a final “back on the bus” to head home.